Combine sugar and water in a large heavy-bottomed pot. Bring to a boil over medium-high heat. Boil for 1 minute; remove from heat. Stir in peanut butter and vanilla. Beat until thick. (It can help to have two people so you can take turns.) Pour into 8″x8″ pan and allow to cool. 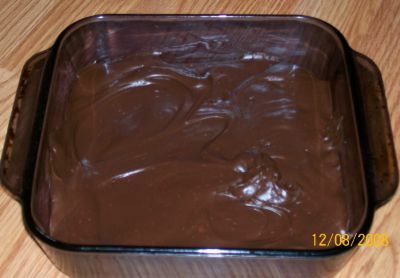 For all the chocolate lovers out there, I’ll share a slightly different recipe for chocolate fudge. 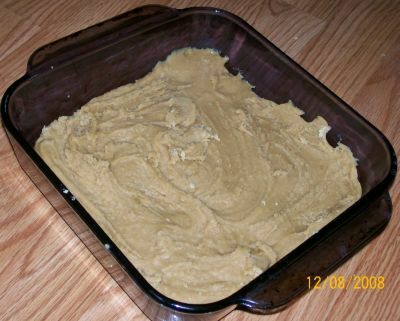 Now, this one doesn’t produce the gourmet texture that the peanut butter recipe produces. I’m sorry about that, but we all know you’ll eat it anyway. Place chocolate chips and sweetened condensed milk into a microwave safe bowl and microwave on high for 1 1/2 to 2 minutes. Stir. Microwave for 1 more minute; stir until completely smooth. Stir in vanilla and pour into prepared dish. Refrigerate until firm – about two hours. This morning, I was unloading the dishwasher (I try to do my part, you know…) when I found the container that we’d been keeping the fudge in. What? The fudge is gone? Noooooooooooo!! That can only mean one thing. It’s time to make more. I used the chocolate recipe after seeing Nigella make it with toasted pistachio nuts. It was awesome. However, the melting all took place on a stovetop, no double boiler needed, and I was surprised how creamy the end product turned out. In fact, I initially made it to prove it wouldn’t turn out properly. One note: Keep it well sealed as it dries out a little more quickly than other recipes. Just my 2 cents. hmm. we always used a jar of marshmallow creme in addition to the ingredients you have listed. makes for the absolute best fudge! really! does fudge travel well? I want to mail some to friends, but I’m unsure of how it will fare. That’s a good idea, Robby, and I’m sure it would work just fine. I actually prefer the texture of the peanut butter recipe…the chocolate one is too chewy for my tastes, but if you like the chewy texture, substituting pb chips would be great. Hi, Angie. Fudge does travel well. Just make sure to put it in an air tight container, and it should last for a couple weeks. Hello! I am the head chef of a Spanish Restaurant called ‘La comida sabrosa’- Meaning tasty Food ! You all must try it! FABULOUS! Must say … awesome dish! perfect texture and taste… not too fatty either! It is Easy and Tasty! Perfect combination :) Simply a perfect dessert! My customers crave for this dish’s recipe !! It is a Beautiful dish! Very yummy! Must try at home and give your children a special treat!